A succulent blend of prime cuts of pork with thyme, nutmeg, sage & pepper. Britain's Best Sausage Highly Commended - industry awards 2016. Born & bred, farmed & fed - East Anglia. 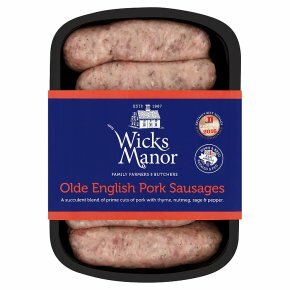 Made with 75% pork meat.Farm made prime pork sausages These delicious Olde English Pork Sausages are prepared by hand in our farm butchery using only the succulent prime cuts of British farmed pork blended with thyme, nutmeg, sage and pepper. Cook before consumption. For best results, do not prick sausage skins. Remove all packaging. All cooking appliances may vary, these are guidelines only. Check food is piping hot throughout before serving.Not suitable for microwaving. (15-16 minutes): Place under a pre-heated medium grill, turning occasionally. (16-20 minutes) place on a lightly greased baking tray in the centre of a pre-heated oven at 190°C/170°C Fan/Gas mark 5. (15-16 minutes): Fry in a little oil a medium heat, turning occasionally.